Nations in which English is an official language (de facto or de jure). Anglosphere countries are a subset of those where English is the main native language. The term "majority language" is here defined as a language of which more than 50% of the population have some command. It does not mean that this command is native, nor that English is the most widely used language of the respective country. Additionally, there are 79 million native English speakers in Nigeria, 92 million in the Philippines, 60 million in the United Kingdom, 45 million in Germany, 30 million in Bangladesh, 29 million in Canada, 25.1 million in Australia, 4.7 million in the Republic of Ireland, and 4.9 million in New Zealand. Other countries such as Ghana and Uganda also use English as their primary and official languages. In the European Union, English is one of 24 official languages and is widely used by institutions and majority of population as native (United Kingdom and Ireland) and as a second language in other member states. Estimates that include second language speakers vary greatly, from 470 million to more than 2 billion. David Crystal calculates that, as of 2003, non-native speakers outnumbered native speakers by a ratio of 3 to 1. When combining native and non-native speakers, English is the most widely spoken language worldwide. Besides the major varieties of English, such as British English, American English, Canadian English, Australian English, Irish English, New Zealand English and their sub-varieties, countries such as South Africa, India, the Philippines, Jamaica and Nigeria also have millions of native speakers of dialect continua ranging from English-based creole languages to Standard English. India now claims to be the world's second-largest English-speaking country. The most reliable estimate is around 10% of its population or 125 million people, second only to the US and expected to quadruple in the next decade. 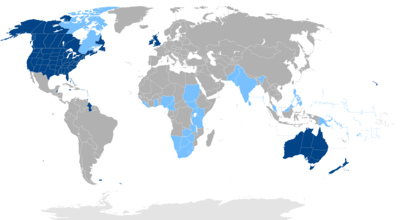 The Anglosphere - Countries where English is spoken natively by the majority of the population. There are six large countries with a majority of native English speakers that are sometimes grouped under the term Anglosphere. In numbers of English speakers they are: the United States of America (at least 231 million), the United Kingdom (in England, Scotland, Northern Ireland and, Wales) (60 million), Canada (at least 20 million), Australia (at least 17 million), Republic of Ireland (4.8 million) and New Zealand (4.8 million). English is also the primary natively spoken language in the countries and territories of Anguilla, Antigua and Barbuda, the Bahamas, Barbados, Belize, Bermuda, the British Indian Ocean Territory, the British Virgin Islands, the Cayman Islands, Dominica, the Falkland Islands, Gibraltar, Grenada, Guam, Guernsey, Guyana, the Isle of Man, Jamaica, Jersey, Montserrat, Pitcairn Islands, Saint Helena, Ascension and Tristan da Cunha, Saint Kitts and Nevis, Saint Vincent and the Grenadines, South Georgia and the South Sandwich Islands, Trinidad and Tobago, and the Turks and Caicos Islands. In some countries where English is not the most spoken language, it is an official language. These countries include Botswana, Cameroon (co-official with French), Eswatini (Swaziland), Fiji, Ghana, Hong Kong, India, Kenya, Kiribati, Lesotho, Liberia, Malta, the Marshall Islands, Mauritius, the Federated States of Micronesia, Namibia, Nigeria, Pakistan, Palau, Papua New Guinea, the Philippines, Rwanda, Saint Lucia, Samoa, Seychelles, Sierra Leone, Singapore, the Solomon Islands, Sri Lanka, Sudan, South Africa, South Sudan, Tanzania, Uganda, Zambia and Zimbabwe. There also are countries where in a part of the territory English became a co-official language, in Colombia's San Andrés y Providencia and Nicaragua's Mosquito Coast. This was a result of the influence of British colonization and American colonization in these areas. India has the largest number of second-language speakers of English (see Indian English); Crystal (2004) claims that combining native and non-native speakers, India has more people who speak or understand English than any other country in the world. However, most scholars and research that has been conducted dispute his assertions. Pakistan also has the English language (Pakistani English) as a second official language after the Urdu language as the result of British rule (raj). Sri Lanka And The Philippines use the English language, too, as the second and third official language after Sinhala, Tamil, and Filipino. English is one of the eleven official languages that are given equal status in South Africa (South African English). It is also the official language in current dependent territories of Australia (Norfolk Island, Christmas Island and Cocos Island) and of the United States of America (American Samoa, Guam, Northern Mariana Islands, Puerto Rico (in Puerto Rico, English is co-official with Spanish) and the US Virgin Islands), and Hong Kong Special Administrative Region of the People's Republic of China. Although the United States federal government has no official languages, English has been given official status by 32 of the 50 US state governments. Furthermore, per United States nationality law, the process of becoming a naturalized citizen of the US entails a basic English proficiency test, which may be the most prominent example of the claim of the nation not having an official language being belied by policy realities. Although falling short of official status, English is also an important language in several former colonies and protectorates of the United Kingdom, such as Bahrain, Bangladesh, Brunei, Cyprus and the United Arab Emirates. States and territories in which English is the first language of the majority of the population. States and territories in which English is an official, but not the majority language. Because English is so widely spoken, it has often been referred to as a "world language", the lingua franca of the modern era, and while it is not an official language in most countries, it is currently the language most often taught as a foreign language. It is, by international treaty, the official language for aeronautical and maritime communications. English is one of the official languages of the United Nations and many other international organizations, including the International Olympic Committee. It is also one of two co-official languages for astronauts (besides the Russian language) serving on board the International Space Station. English is studied most often in the European Union, and the perception of the usefulness of foreign languages among Europeans is 67 percent in favour of English ahead of 17 percent for German and 16 percent for French (as of 2012[update]). Among some of the non-English-speaking EU countries, the following percentages of the adult population claimed to be able to converse in English in 2012: 90 percent in the Netherlands, 89 percent in Malta, 86 percent in Sweden and Denmark, 73 percent in Cyprus, Croatia, and Austria, 70 percent in Finland, and over 50 percent in Greece, Belgium, Luxembourg, Slovenia, and Germany. In 2012, excluding native speakers, 38 percent of Europeans consider that they can speak English. Books, magazines, and newspapers written in English are available in many countries around the world, and English is the most commonly used language in the sciences with Science Citation Index reporting as early as 1997 that 95% of its articles were written in English, even though only half of them came from authors in English-speaking countries. In publishing, English literature predominates considerably with 28 percent of all books published in the world [leclerc 2011][full citation needed] and 30 percent of web content in 2011 (down from 50 percent in 2000). ^ "Crystal, David. The language revolution. John Wiley & Sons, 2004". ^ Crystal, David (2003). English as a Global Language (2nd ed.). Cambridge University Press. p. 69. ISBN 978-0-521-53032-3. ^ BBC News 27 Nov 2012: English or Hinglish - which will India choose? 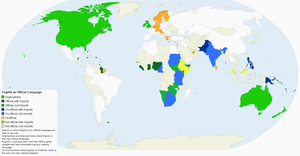 ^ Data are from national censuses conducted in 2010 or 2011 in the reported countries. ^ Nancy Morris (1995). Puerto Rico: Culture, Politics, and Identity. Praeger/Greenwood. p. 62. ISBN 978-0-275-95228-0. ^ "U.S. English, Inc". U.S. English. Archived from the original on 6 January 2010. Retrieved 21 April 2010. ^ "U.S. English Chairman Applauds West Virginia Bill to Declare English the States Official Language". U.S. English. Archived from the original on 1 April 2016. Retrieved 23 March 2016. ^ a b David Graddol (1997). "The Future of English?" (PDF). The British Council. Archived from the original (PDF) on 19 February 2007. Retrieved 15 April 2007. ^ Crystal, David (2003a). English as a Global Language (2nd ed.). Cambridge University Press. p. 69. ISBN 978-0-521-53032-3. Retrieved 4 February 2015. Lay summary (PDF) – Library of Congress (sample) (4 February 2015). Northrup, David (20 March 2013). How English Became the Global Language. Palgrave Macmillan. ISBN 978-1-137-30306-6. Retrieved 25 March 2015. Lay summary (25 March 2015). ^ European Commission (June 2012). Special Eurobarometer 386: Europeans and Their Languages (PDF) (Report). Eurobarometer Special Surveys. Retrieved 12 February 2015. Lay summary (PDF) (27 March 2015). ^ Jambor, Paul Z. (April 2007). "English Language Imperialism: Points of View". Journal of English as an International Language. 2: 103–123. Australian Bureau of Statistics (28 March 2013). "2011 Census QuickStats: Australia". Retrieved 25 March 2015. Crystal, David (19 November 2004b). "Subcontinent Raises Its Voice". The Guardian. Retrieved 4 February 2015. Northern Ireland Statistics and Research Agency (11 December 2012). "Census 2011: Key Statistics for Northern Ireland December 2012" (PDF). Statistics Bulletin. Table KS207NI: Main Language. Retrieved 16 December 2014. Ryan, Camille (August 2013). "Language Use in the United States: 2011" (PDF). American Community Survey Reports. p. 1. Archived from the original (PDF) on 2016-02-05. Retrieved 16 December 2014. Census 2011: Census in brief (PDF). Pretoria: Statistics South Africa. 2012. Table 2.5 Population by first language spoken and province (number). ISBN 9780621413885. Archived (PDF) from the original on 13 May 2015.